NFPA Members save an additional 10%. This flexible and money-saving NEC® Set includes the 2017 edition NEC Looseleaf and the expanded full-color NEC Handbook. Stay organized and on top of the changing electrical environment. 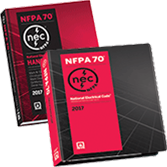 Update to the 2017 edition of NFPA 70®: National Electrical Code® in a sturdy Looseleaf format you can customize to meet your job demands. Loaded with practical solutions and in-depth support, the 2017 NEC Handbook guides your work with expert commentary, real-world examples, new navigational aids, and more full-color visuals than ever before. Improve job performance and stay up-to-code with this NEC Set. To succeed today's electrical field, work with the 2017 edition of the NEC and NEC Handbook Set including the NEC Looseleaf that lets you add or remove pages for any electrical project. Stay up-to-code and save 15%! Get the 2014 NFPA 70®: National Electrical Code® Looseleaf and NEC® Handbook together in this flexible 2014 NEC Set. Update to the new benchmark for electrical safety! As the 2014 NEC advances to allow for safe implementation of the latest in electrical system and equipment technology, the 2014 NEC Handbook helps you stay up-to-code by explaining the reasoning behind Code concepts. In today's field, there's no substitute for the 2014 NEC Looseleaf and NEC Handbook Set. For electrical work in a changing world, make sure you have the 2014 NEC Set. The NEC Set is the #1 electrical safety team used by contractors, engineers, electricians, safety officials, inspectors, and architects. Order now and stay up-to-code.